Should you be concerned about oak wilt and are your trees at risk? Oak wilt , Ceratocystis fagacearum, is a fungus that has been introduced to the Central Texas area since the 1960’s with devastating results. It is thought to have been in the US since the 1800’s. It is widely believed that it was originally brought in to this specific area from infected Spanish oak (Southern red oak) firewood. When a Spanish oak dies, it forms fungal mats in the Spring. These fungal mats form on the trunk wood. The nitidulid beetles (pin-head sized), feed on the fungal mats and then can then transfer (vector) the fungus to other Spanish oaks or live oaks. This is still a mystery, but it is thought to be an introduced disease brought in from Central or South America, possibly Mexico. How? We are not entirely sure, but it could have been vectored into the United States by a sap-sucker woodpecker. These animals may have fed on a beetle carrying the spores, and vectored them into an oak tree while feeding on the sap, starting the whole process. This is, however, only a theory. Which oak trees are susceptible? It is important to note that Spanish oaks can only be infected by the beetle. They do not share grafted roots below ground. Live oak trees, on the other hand, do share grafted roots below the ground. So, when live oaks are infected by the nitidulid beetle from infected Spanish oaks, the disease can spread below the ground and infect other live oaks as it moves from tree to tree through these grafted roots. It can move through the roots at up to 100 feet per year, but may move slower up hills and faster down slopes. What are the symptoms of oak wilt? Oak wilt leaf symptoms are very prolific. The leaves form a rusty discoloration along the center vein of the leaf, which then moves out towards the leaf margins via the smaller veins. To the trained eye, this cannot be confused with anything else. Additionally, when oak wilt moves into an area, it spreads out radially from the first newly infected live oak tree in a circular pattern through the roots of the closest live oaks. A study done at Fort Hood by Dr. David Appel, current head of the Department of Microbiology and Plant Pathology at Texas A&M shows that the beetles fly up high into the atmosphere and can be carried for miles on windy days. They then come down in new areas and form new epicenters in the direction of the prevailing winds. It is important to note that oak wilt is often mis-diagnosed. Most live oaks that I am called out to inspect are declining due something unrelated to oak wilt. Although oak wilt is not always the cause of defoliation in oaks, always call me to check anyway. Although unlikely, oak wilt is around and if your trees do show symptoms, they need to be treated immediately for best results. If you suspect that one of your trees has oak wilt of if oak wilt has moved into your neighborhood, contact us for a free evaluation and plan of action. 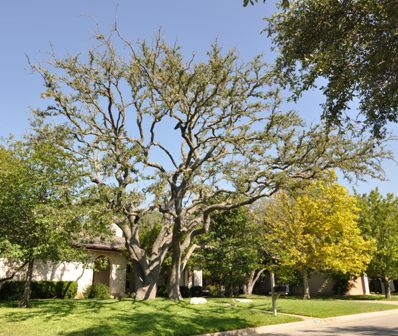 https://centraltexastreecare.com/wp-content/uploads/2015/06/austin-tree-care1.png 0 0 Andy Johnson https://centraltexastreecare.com/wp-content/uploads/2015/06/austin-tree-care1.png Andy Johnson2012-05-22 15:57:432012-05-22 15:57:43What is oak wilt? What is mistletoe and should I be concerned if I have it in my trees? Why should I trim my Austin trees?